For simple pleasures on a cold day, what could be better than soup! Especially with something earthy and heart-warming like lentils. Traditional Greek soups are light, brothy affairs. They are very simple, combining only a couple of ingredients and often putting pulses in the spotlight. As a kid, I always thought of soups as a cold remedy. Well after spending a few years in the cold and wet of London, I now know a little better and definitely enjoy a comforting bowl of lentils with a touch of vinegar. Before cooking remember to prepare your lentils. It’s really simple, just rinse under a little cold water and have a quick look in case there are any shrivelled lentils or debris that you don’t want ending up in your pot. Once you cleaned, boil your lentils for 15 minutes and drain. Now, for the soup: finely chop the onion and cook until translucent. Add the garlic, lentils, bay leaves, half the olive oil and approximately a litre of water. Bring it to the boil and after 15 minutes add the chopped tomatoes and tomato paste with a pinch of sugar and the rest of the oil. Season with salt and pepper towards the end. It should take approximately half an hour, but cooking time largely depends on how fresh and easy to boil the lentils are. So try a few and if they are still hard add some warm water and let them boil a little longer. 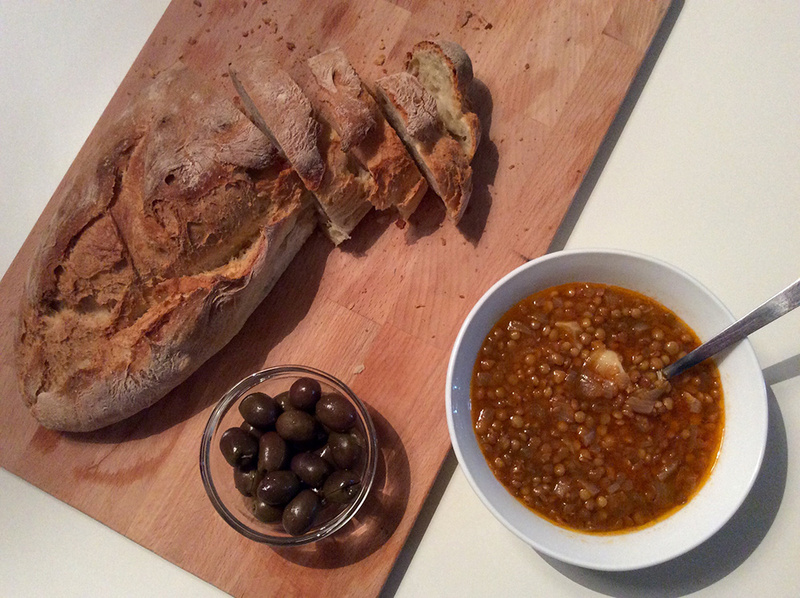 On serving, do add a spoonful of vinegar to your lentil soup. It makes it exceptionally tasty, enjoy! And how much water do you add when you boil fakes for the first time? Hi there, the lentils have to be fully covered with a bit of extra. For a large pot, 500gr lentils it’s approximately a litre.